After I finished The Darkness that Comes Before, there was no way I could stop there. I had to find out where this story was going. I had to know more about the Consult, what happened into the past, how the characters would handle the Holy War, who truly was behind the events shaping the world, and, lastly, I had to read more about one of the most intriguing characters I have ever read—Anasûrimbor Kehllus. I was glad that the Prince of Nothing Trilogy was all published (only to learn later it was just the first of three series of the greater Second Apocalypse Metaseries). 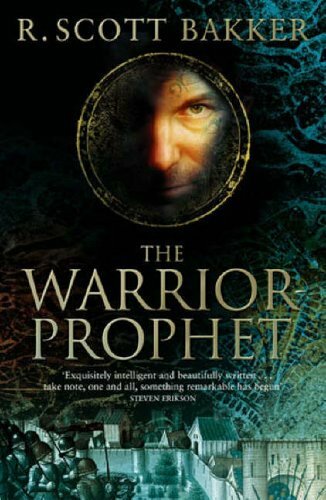 The Warrior Prophet did not disappoint me, leading us from the politicking of the first book into the harsh reality of ancient and medieval warfare. Bakker never once flinches from the depths of human depravity. It lurks in all of us, this capacity to do great harm. The Warrior Prophet is brutal at times. Bakker has been accused of misogyny for how women are treated in his series, but he is illuminating a fundamental part of humans—we forever divide ourselves into nations, tribes, races, and other divisions. And once we have, we are capable of great cruelty on others. A man who would die to protect his wife will have no compulsion murdering the wife of his enemy. Like with the first book, Bakker opens the Warrior Prophet with a quote. Not a fictitious quote from his own setting, but a quote from Immanuel Kant. Bakker is a philosopher of human consciousness. So it should not be surprising that philosophy plays a huge role in his stories. We have several philosophies introduced in the first book, especially the Dûnyain and their pursuit of the Logos—the Absolute. They have stripped everything from the world in the application of their philosophy. They have trained out as much passion and emotion from their students, breeding them for intelligence. They have tried to make its purity sustain itself, as Kant describes above. But Kant is talking about morality, something wholly alien to the Dûnyain Morality has to be its own law, something pure, something remote, something not apart from religious dictations (heaven) or the whims of capricious man (earth). It is something which must be pure. If it doesn’t sustain itself by its own power, then it is suspect because something whispers to it, something unseen, unknown. Something whispering out of the darkness that comes before it. This is a great quote for the book we’re about to read. Morality clashes against morality as religion battles religion. Whose right is moral? Who are the just ones? The Fanim defending their lands, or the Inrithi reclaiming what has been stolen? Maybe neither of them are, and we are about to watch unfold a great tragedy of death and suffering while something whispers from the shadows. Something manipulating, something corrupting. I hope you are excited for The Warrior Prophet! If you haven’t gotten bored yet, click her for Chapter One.